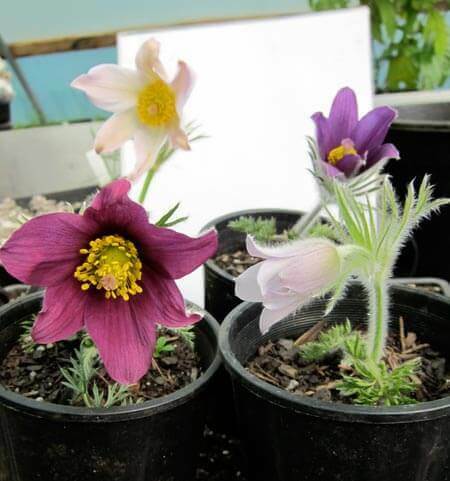 Pulsatilla vulgaris (Pasque Flower, Common Pasque flower, Dane's Blood) belongs to the Buttercup family (Ranunculaceae), native to western, central and southern Europe. It grows to 15-30 cm high and when it is fruit-bearing up to 40 cm. The roots go deep into the soil (to 1 m). The finely-dissected leaves are arranged in a rosette and appear with the bell-shaped flower in early spring. It grows in sparely wooded pine forests or meadows, often on a sunny sloping side with calcium rich soil. It is also the county flower of the English counties of Cambridgeshire and Hertfordshire. It is the main ingredient in the French tonic h&eacute;patoum, taken for crise de foie and to help the production of bile. Mixed colours only. White, Pink or Mauve.